The party advancing money to a borrower at the closing table in exchange for a note evidencing the borrower's debt and obligation to repay. 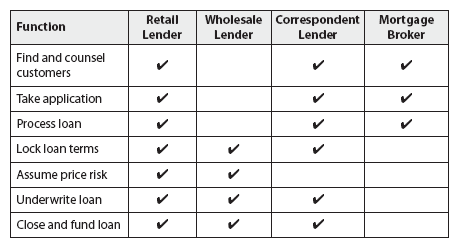 lenders.” Lenders who have certain functions performed for them by mortgage brokers or correspondents are called “wholesale lenders.” Many large lenders have both retail and wholesale divisions. Wholesale lenders will have different departments to deal with correspondent lenders and mortgage brokers. The division of functions is shown in the table on the next page. Correspondent lenders are typically small and depend on wholesale lenders to protect them against pipeline risk. A correspondent lender locks a price for a borrower at the same time as the correspondent locks with a wholesale lender. Mortgage Banks Versus Portfolio Lenders: Mortgage banks sell all the loans they make in the secondary market because they don't have the long-term funding sources necessary to hold mortgages permanently. They fund loans by borrowing from banks or by selling short-term notes, repaying when the loans are sold. Mortgage banks now dominate the U.S. market. Of the 10 largest lenders in 2002, nine were mortgage banks and only one was a portfolio lender. However, most of the large mortgage banks are affiliated with large commercial banks. Portfolio lenders include commercial banks, savings banks, savings and loan associations, and credit unions. They are sometimes referred to as “depository institutions” because they offer deposit accounts to the public. Deposits provide a relatively stable funding source that allows these institutions to hold loans permanently in their portfolios. adjustable rate mortgages. It would be a mistake to place too much reliance on this rule, however, because the variability within each group is very wide. ONE in seven home owners took out their home insurance with their mortgage lender rather than going elsewhere, a survey has found. Lloyds Banking Group, Britain's biggest mortgage lender, said it had decided to impose a lending cap for people looking to borrow more than PS500,000. WHEN you remortgage your property your new mortgage lender will require their loan to be correctly secured against the legal title of your property at the Land Registry. Ask how long the mortgage lender has been in business. The community-based mortgage lender is an endangered species. This law provides that upon written demand from a borrower sent by certified or registered mail, stating that the borrower is satisfying the mortgage and requires information as to the balance due, the mortgage lender must such information within 20 days. Many of the banks that provide mortgage lenders with wire transfer services have begun requiring mortgage lenders to enter into new funds transfer agreements that aggressively shift liabilities away from the bank and toward the mortgage lender. The wholesale mortgage lender uses DocWin during the processing of approximately 500 loans they close each month. Millennium Funding Group is a national mortgage lender with more than $1 billion in annual originations offering wholesale lending solutions to mortgage brokers and the secondary mortgage market. American Guardian Home Loans, a leading wholesale mortgage lender specializing in Alt-A and nonprime products, has partnered with the California Association of Mortgage Brokers (CAMB), to offer a preferred pricing program for CAMB-member brokers. A leading residential mortgage lender, Metrocities Mortgage's lending territory covers all 50 states.